Professor Gary Hamel made a rallying cry that was so loud it could be heard 17km away in The Palace of Versailles,”Kill bureaucracy and you’ll unclog the arteries of business,” whilst Dr.Daniel Thorniley warned us about the economy, and it was not good news. Debt, low growth and a rising populist tide in politics means soon we will all be working in the gig economy, whether we like it or not. How will we survive this extended downturn? “What will we eat?” they ask. “Let them eat cake!” the response of the ancien régime. If you can spell it, surely you can destroy it, right? The symptoms of bureausclerosis Hamel described were: added management layers, isolation of leaders, longer decision cycles, increase in formalized policies, rule proliferation, increase in power of staff groups, organization becomes primitive, loss of ‘voice’ from staff, increase in legal processes, decrease in risk-taking, and the politicization of it all. In HR, changing business models and global economic drivers will determine whether we are scrambling for candidates, sweating our employees for discretionary effort, or working on clever algorithms to automate work. I would guess a larger proportion of the 3,500 delegates will be joining the gig economy over the next few years. One thing’s for sure, we might not be able to guess where the economy is going, but there are plenty of technology developments to get excited about. So, if our business models and organisations are changing before our eyes, this raises some big questions. How does this affect the way we think of work, organisations, and society? Do our old people management practices still work? This message seems to resonate with the HR Technology industry and is especially true now. My concern is whether we have the right set of people management practices for the type of organisations that Hamel says will flourish? Are we in danger of simply crystallising the processes that served us well in the last century? These and other questions present the challenge for HR and the technology industry today. 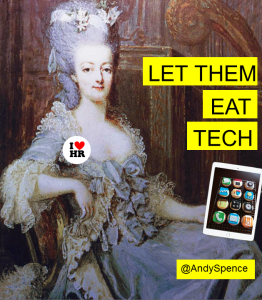 I had the pleasure of introducing some excellent presentations in the well-attended HR Tech stream, so could not attend as many presentations as usual. However, my fellow blog squad comrades have done a great job of sharing what they saw. I was also fortunate enough to look under the bonnet of some of the latest tech tools, and I am particularly interested in the use of predictive analytics and artificial intelligence in solving business problems. I saw some useful tools that work as a stop gap for current recruiting/ATS software, e.g. tools that help prioritise recruiters workload using simple algorithms. There were many great stories of companies building the new republic, making progress, solving business problems and embracing technology. Technology is indeed being used to transform whole industries and the biggest impact on HR will not be on how we operate, but on how we manage work in the future. For those in HR and leadership roles, there is plenty we can do before we even think of buy new software. We can start by asking, what is the evidence that this practice (e.g. performance, talent, hiring, learning, engagement) works in our organisation now, and will do in the future? It was a dismal economist who gave our profession the name, Human Resources, rendering people as an asset to manage. Maybe this term also belongs to the last century along with Bureaucracy? As with many revolutions, there will be casualties, but change can pave the way for a new order and a better approach to people management. So when managers in your organisation ask about the conference and the impact on their staff, you might mention defeating bureausclerosis, the challenges of low growth and the gig economy. This entry was posted on Monday, December 5th, 2016 at 2:30 pm	and is filed under Cognitive Diversity, Future of Work, HCM, HR Blogs, HR Careers, HR Conference, HR Director, HR SaaS, HR Strategy, HR Tech Europe, HR Tech World, HR Technology, HR Tools, HR Transformation, Leadership, People Analytics, Quantified Workplace. You can follow any responses to this entry through the RSS 2.0 feed. You can trackback from your own site.